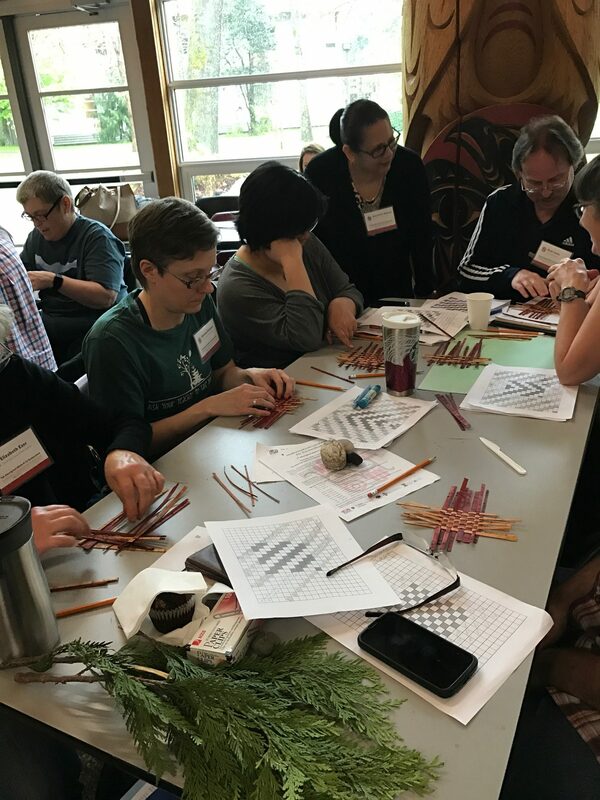 Mathematical Landscapes for Reconciliation – this year’s theme of the 7th Aboriginal Mathematics K-12 Symposium – drew more than 140 educators, community members, teacher candidates and researchers for a full day of exploring mathematics, community and culture. 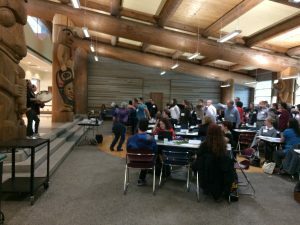 Participants from across the province including Haida Gwaii, Fraser Lake, Prince George, Whitehorse, Fort St. John, Vernon, Kamloops, Kelowna, Osoyoos, Powell River, Port Hardy, Nanaimo and the Lower Mainland met May 11 at the Sty-Wet-Tan Hall in the First Nations Longhouse University of British Columbia to share and discuss strategies for improving Aboriginal/Indigenous mathematics education. Tsawaysia Spukwus Alice Guss and Spelexilh Ajeanette Dawson of the Squamish Nation opened the morning with a drumming song that involved participants in welcoming and recognizing both human and non-human beings from land, air and sea. This drumming and Dr. Jo-ann Archibald’s story-telling prepared all of us to engage in the day’s activities. 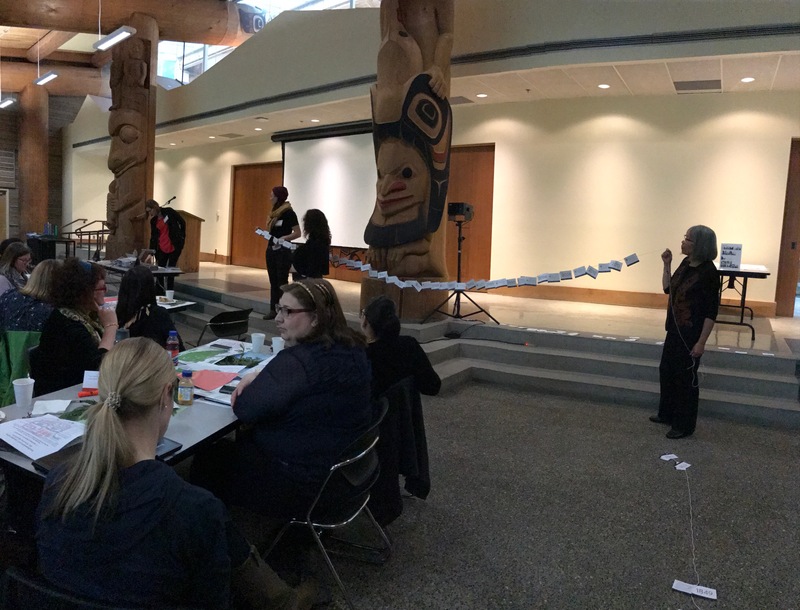 Reconciliation activities involved opportunities for participants to increase awareness and knowledge of Aboriginal people in Canadian and BC history. 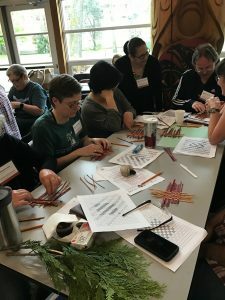 Presentations focused on listening to the land and Indigenous perspectives on the importance of relationships between human, non-human and more-than human worlds prepared participants for learning about cedar and it’s use by coastal First Nations. 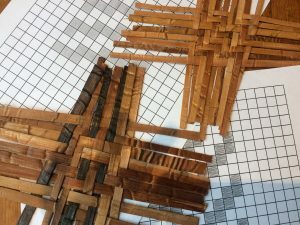 After exploring mathematic al patterns of weaving, Tsawaysia Spukwus Alice Guss led participants in weaving their own small cedar mats while discussing possibilities and implications for classrooms. This year eight participants shared their projects during the informal sharing part of the program. Barb Wagner of Fort St. John, David Sufrin of Vancouver Island University, Freddy Luneta of University of Johannesburg South Africa on sabbatical at UBC, Junita Coltman of the First Nations Education Steering Committee, and Kirsten Urdahl-Serr of Maple Ridge participated in the Igniting the Sparkle Sharing by offering short presentations of their projects on Indigenous mathematics education with school students and teacher candidates. Misty Paterson of West Vancouver, Sally Hart of Duncan, and Chelsea Bitgood of Kelowna engaged participants through table displays of their projects. A range of ideas and strategies were presented and for many was reported as the highlight of the day. 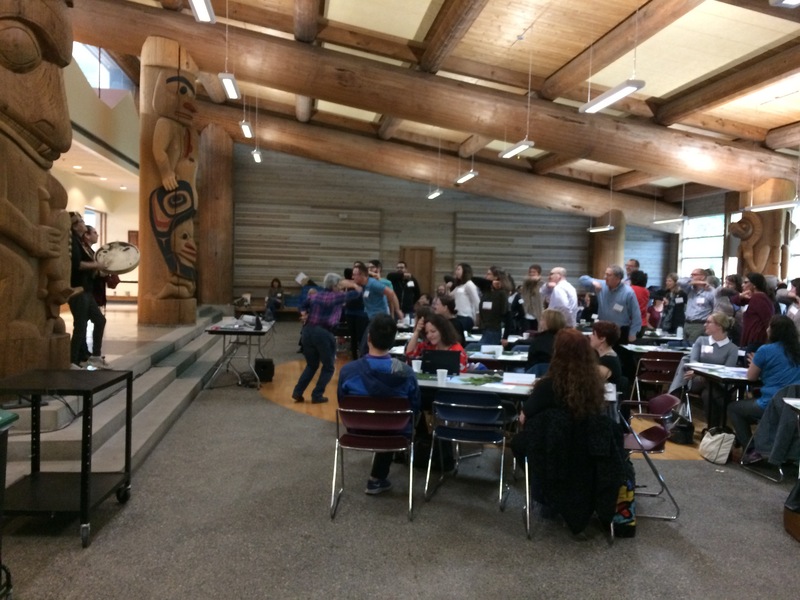 Overall participants described the 7th Aboriginal Mathematics K-12 Symposium as “thrilling”, “outstanding” and “inspiring.” We look forward to next year’s event. Success of the Symposium was made possible with the help of 15 volunteers including faculty, teacher education students and graduate students and with support from our sponsors: The First Nations House of Learning, UBC’s Department of Curriculum and Pedagogy, Indigenous Education Institute of Canada, Pacific Institute for the Mathematical Sciences, UBC’s Indigenous Teacher Education Program, and The Actuarial Foundation of Canada.